Amazon conducted a poll just before the start of the year 2009 asking people on what are their New Year Resolutions. The [top two resolutions](http://www.didigetthingsdone.com/2009/01/02/amazons-top-10-new-years-resolutions/) were (1) Lose Weight and (2) Get Your Finances in Order. What is strange is that you and I would think these are [solved problems](http://frugaldad.com/2009/02/22/personal-financial-software/), right? But yet these are the top resolutions for the new year! We all know how to lose weight – eat less and exercise more. [But it requires discipline](http://www.lifemojo.com). We all know how to get our finances in order – spend less and earn more. But it requires discipline. 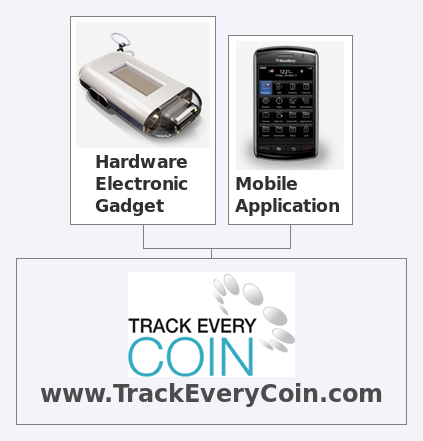 Our vision for the [“Track Every Coin” system](http://www.trackeverycoin.com) that we are building is to exactly help you do this – to help you spend less, save more, and in the process help you get your personal finances in order. ## So what is the problem again? ## So what is the product? * The active agent where you make your entries – which is either a hardware device or a mobile phone application, based on your preference. * The hardware device is for those who like to have a cool-looking gadget to carry around, and want to make entries within 10 seconds. * The mobile phone application is for those who have GPRS connections on their mobile phones. * The data analyzer – which is a website where you get to slice and dice your data. At its core, the system is an expense tracking system, simply because that is the [first step that every personal finance writer recommends](http://www.getrichslowly.org/blog/2009/01/05/9-methods-for-mastering-your-money-in-2009/). If you don’t know where the money is going, you won’t know how to manage it. The logic is simple : [We need data to improve](http://lifehacker.com/5242319/six-easy-ways-to-graph-your-life), whether it is the school score cards for your kids or the mileage for your car or statistics for your favorite cricketers. We bring over the same facility to you for your money! * Know how much an occasion will cost you – Stay within your trip budget, know how much a weekend trip will cost you, know how much transportation accounts towards your trips, and more. * Analyze where your money is going – Know if you are spending more on fuel, if you are spending too less on your hobbies, or how much money you need on an average day. _We aim to launch the product in July 2009._ [Sign up now](http://www.trackeverycoin.com) at the website to get special offers when we launch! We’ll be writing more about how we have designed and built TrackEveryCoin on this blog. We look forward to your feedback either here on this blog or [via email](http://www.trackeverycoin.com/html/write_us.html). The product looks cool , but i am thinking how do one add notes ? expense details or categorise or tag a particular expense using such a small device ? if the device is just to enter the expense and if only we need to enter details using a computer , then its not for me , because i don’t remember for what all i spend usually and iam not sure if this problem is solved by your gadget , would be interested to know more . Good Luck IonLab , go rock ! @Sashank You will be able to categorize using the device. We will reveal more when the product is officially launched 🙂 Thanks for the encouragement!